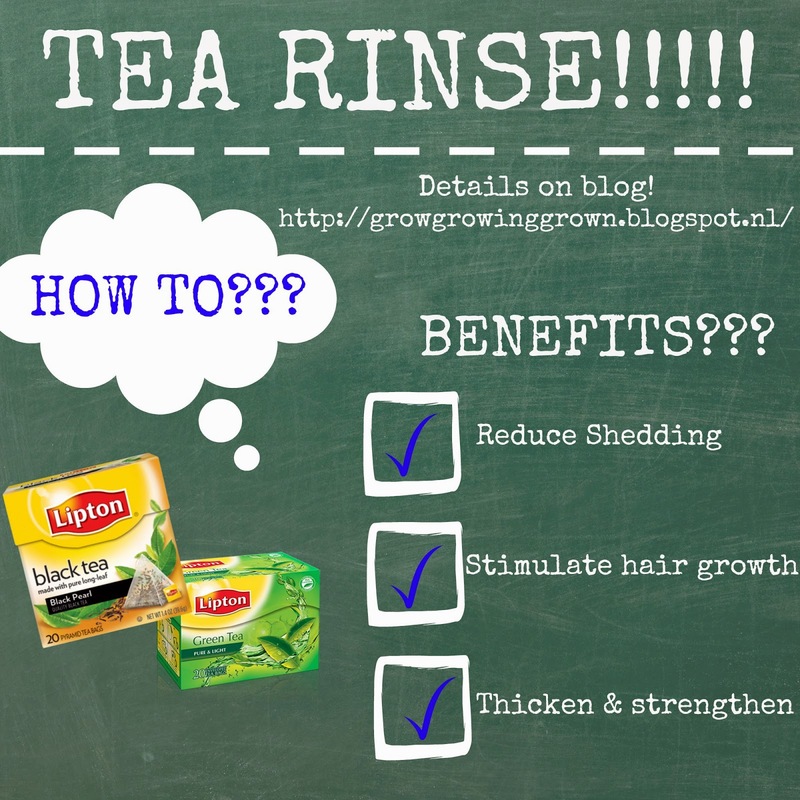 HAIR TIPS: Benefits of Tea Rinses! So remember when I did the tea rinse while I was in braids? My main reason was to help reduce shedding, but there are many more benefits of tea rinses depending on the different types of teas. 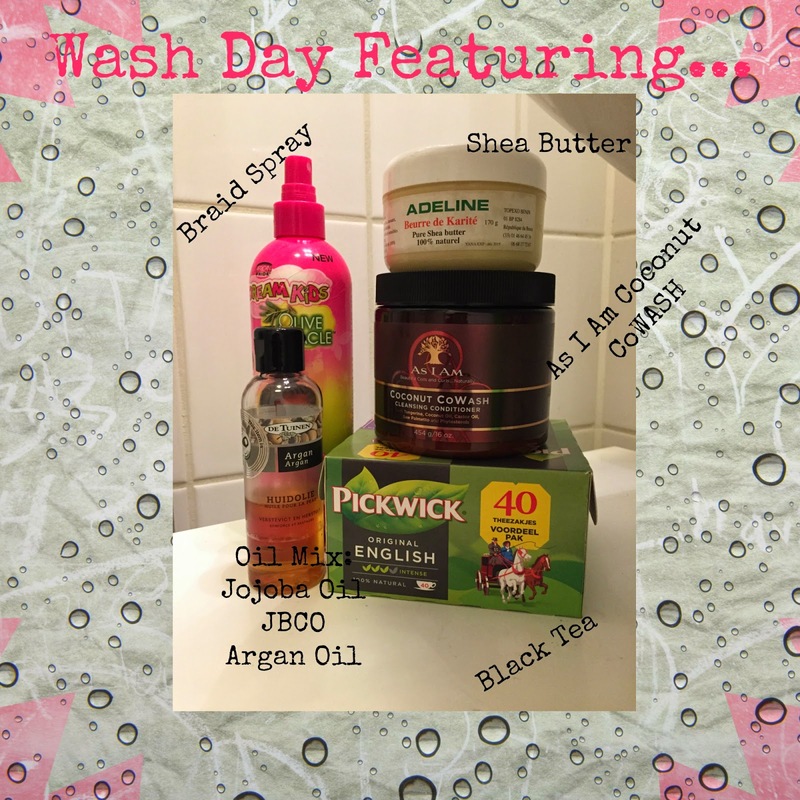 I highlight the benefits I have researched and how to do a tea rinse. You can easily make a tea rinse at home by steeping 3-4 bags of tea-black or green or both- in half a liter of hot water. This should be steeped for as long as possible, perhaps 3-4hours. If in a hurry, I advise you as least wait till the water is cool enough. It is best to use this water as the last rinse after you have shampooed, and before you deep condition your hair. 1) Research shows that the caffeine helps curb the growth of DHT (Dihydrotestosterone), which is known to hinder hair growth and cause hair fall(shedding) (Green and Black tea). 2) Helps prevent and cure common hair problems such as dandruff and psoriasis by reducing the inflammation due to its antiseptic properties (Green tea). 3) Helps stimulate hair growth and soften the hair. (Green and Black tea). 4) A good source of Vitamin E and Vitamin C which boosts lustrous hair, and panthenol which is sometimes used in shampoos/conditioners to strengthen hair (Green tea). 5) Darkens hair colour (Black tea). Any other benefits you know, share with us in the comments below! My last washday was the simplest washday ever. I have been in braids for 2 weeks and I finally washed them for the first time. To be honest, when I am in braids I usually slack off a bit, because I feel I can get away with not being so strict. This is okay IF and ONLY IF you treat your hair very well before you take off braids, if not, you’ll see the results of your slacking off going down the drain, literally. Anyways, my washday involved a nice tea rinse and a cowash. I have been looking into doing a tea rinse or coffee rinse and I finally settled on the former. I have done a tea rinse in the past and it turned out great so I decided why not. Plus I am not a fan of coffee, the taste and especially the smell so I felt it’ll be silly to pour that over my head despite my dislike for it. Anyways, tea rinses are wonderful for many reasons, but the main reason I do it is due to its ability to help reduce shedding (I hope to do a full post about the benefits of tea rinses soon). As I have said probably 100 times, I am in braids and this means my shed hair is currently accumulating. This can lead to further tangles when taking out the braids so I figured this is the perfect time for a rinse. I steeped my black tea in hot water for about 4-5hours, letting it cool off as well as absorb as many “nutrients” as possible, if that makes sense. I bent over the sink, putting an extra bowl below my head to catch the tea so as to repeat the process again. Once I was done, I wrapped my braids in a towel to soak up any excess water and sat for about 30mins to an hour. Next, I went into the shower and using my As I Am coconut cowash, I began to wash my hair. 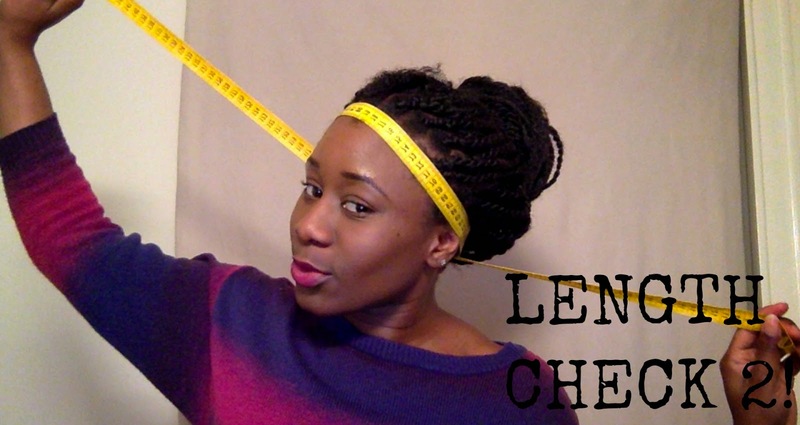 I focused mainly on my scalp and any excess I used to coat the length of my braids, up until where my actual hair ends. I rinsed, repeated the step and did a final rinse. I made sure to rinse my scalp thoroughly and in the end, my hair felt pretty clean. I was pleasantly surprised, cause the product didn’t lather up like a shampoo (not sure if this normal to others that have used this product, let me know in the comments please), but it did as expected, left my hair moisturised without feeling mushy. I squeezed the excess water by making my palms tighter as I went along the length of the braids, rather than twisting the hair like you would a towel. I then put it in a big bun and finished up in the shower. Right before I left the shower, I put my head once more under the shower-head for a final rinse under cold water. I then proceeded to warp my hair in a cotton tee for about 10mins just to soak up excess water. I let my braids fly free for an hour before putting it up into a ponytail and tying it up for bed. And that was it; quiet an extensive explanation for such a quick/simple process yea? LOL. PS: To maintain my braids in-between washes, I simply repeat the last step-LOC method-as much as I feel is needed. This can be anywhere from every three days to every five days. On one of these days, I may just apply the braid spray and oil. I try to limit it as much as I can to avoid build up, while trying to honor my hair needs. I also try to fit in a scalp massage on these days as they aid in hair growth. It was that time of the month again and I was excited because I was checking my progress. 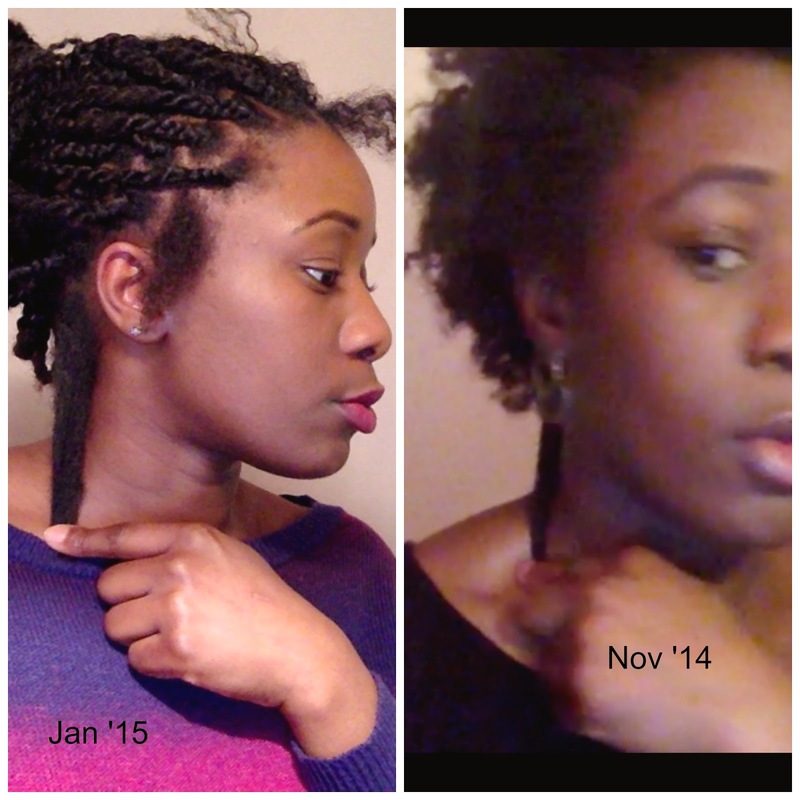 It has been 2 months since I cut off my relaxed ends and became completely natural. I transitioned for about 8 months so I would say I have about 10 months’ worth of growth on my head. I must say, I am pretty happy with my progress. By my calculations, I grew about 1 to 2cm (0.5 to 1 inch), which is expected. Check out my progress in the pictures below. I know I said I would chop off the but I decided to wait till my one year growth mark in March. I also decided that I am not sure (LOL) I will even my hair out as to be honest; hair on one’s head doesn’t always grow at the same rate. I will finally decide in March based on my progress, if I will even everything out or just cut of the straight ends. Anyways, I have started a bottle of Manetabolism. I took it in the past and I did notice all good things, but I feel like I cannot do a proper review because I didn’t track it properly. So that’s my aim this time, to track all pros and cons and come back with a detailed review for you guys. Manetabolism promises to "promote healthy hair, nails and skin by supplying nourishment to the body’s cells and by directly targeting hair folicles, nail beds and skin layers. In addition, it boosts energy levels and helps to strengthen the immune system that will overall promote a healthier you." I will definitely be looking out for each point, from my nails to my hair length to even its overall thickness. Vitamin A: A multi-functional antioxidant that promotes healthy skin, hair and nails and also enhances the immune system. Vitamin A allows the scalp to produce sebum which aids in the thickness and shine of hair. Vitamin C: Helps to build collagen, a protein that is crucial in the progress of hair growth. Effective in the treatment of hair loss. Aids in the health of the skin and enhances the immune system. Increases scalp circulation, which aids in hair growth. Vitamin D3: Plays a key role in preventing hair loss as well as fostering hair growth. Enhances the immune system. Vitamin E: One of the strongest antioxidants available to the body. Increases hair growth and strength by stimulating more blood flow to the scalp. Protects the scalp internally and externally. Enhances the immune system. Vitamin K: Heals damaged scalp and skin and keeps hair healthy. Niacin (B3): Minimizes cholesterol buildup on the scalp, which enhances hair growth. Vitamin B6: Particularly important for hair growth and may cause hair loss when there is a deficiency in the body. Stimulate hair growth, especially in people who suffer from hair loss or thinning. Folic Acid: An essential vitamin that plays a key role in the overall health of hair and is involved in all three hair follicle cycles, helping to determine a hair strand’s quality and longevity. A deficiency can stunt hair growth. Promotes hair growth by renewing the cells that grow hair. A deficiency in folic acid can inhibit the health of your hair and lead to hair loss and premature graying. Vitamin B12: Energy booster. Many people who suffer from hair loss have vitamin B12 deficiency. Nourishes scalp and heals the scalp thus promoting hair growth. Biton (B7): B-complex vitamin useful in the prevention of hair loss and premature graying. Promotes elasticity within the hair’s cortex while thickening cuticles to eliminate breakage. Decreases itchy dry and flaky scalp. Supports the health of the hair, skin and nails. Zinc: One of the most important vitamins needed for healthy hair. It helps the body to sustain healthy hair in many ways. Helps the body to utilize protein and also contributes to speedy hair growth. A deficiency can reduce the effectiveness of other vitamins in the body. So thats its for now. Has any body taken these pills before? How was your experience? Lets discuss in the comment section!! PS: I also made a video!! Please check it out, like, and share. 1. 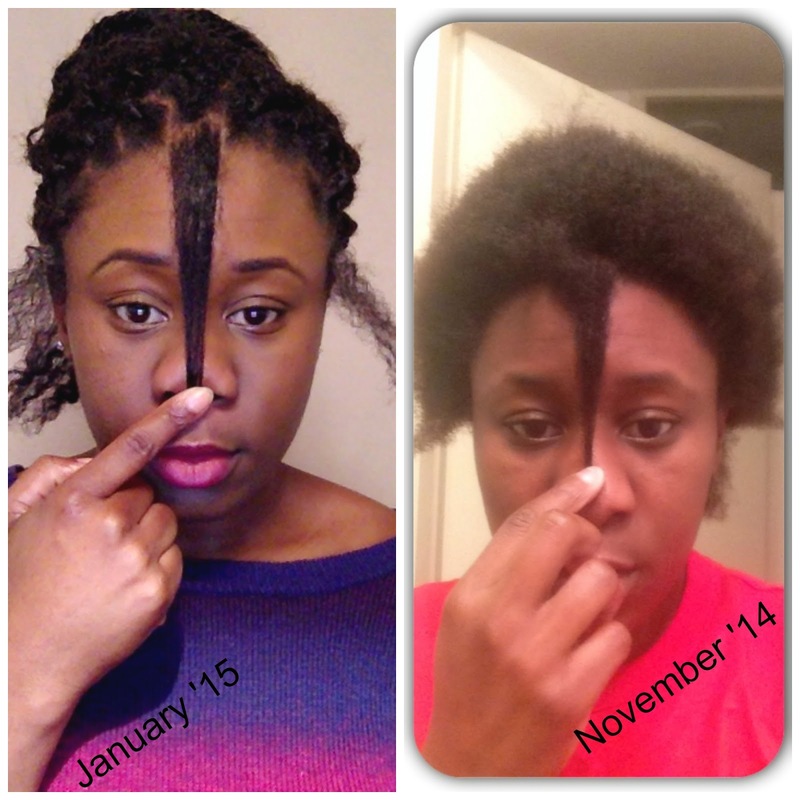 Why did you start your hair journey ? I have always loved all things hair since I was a baby, but I could never grow my hair past shoulder length. I was of the belief that very long hair was only possible for African American and mixed girls until I came across a post on Bella Naija, where a full blooded Nigerian girl had mid back length hair and was shocked. I decided to go through her blog, where I discovered lots of new information about how to care for your hair, and how not to handle your hair. 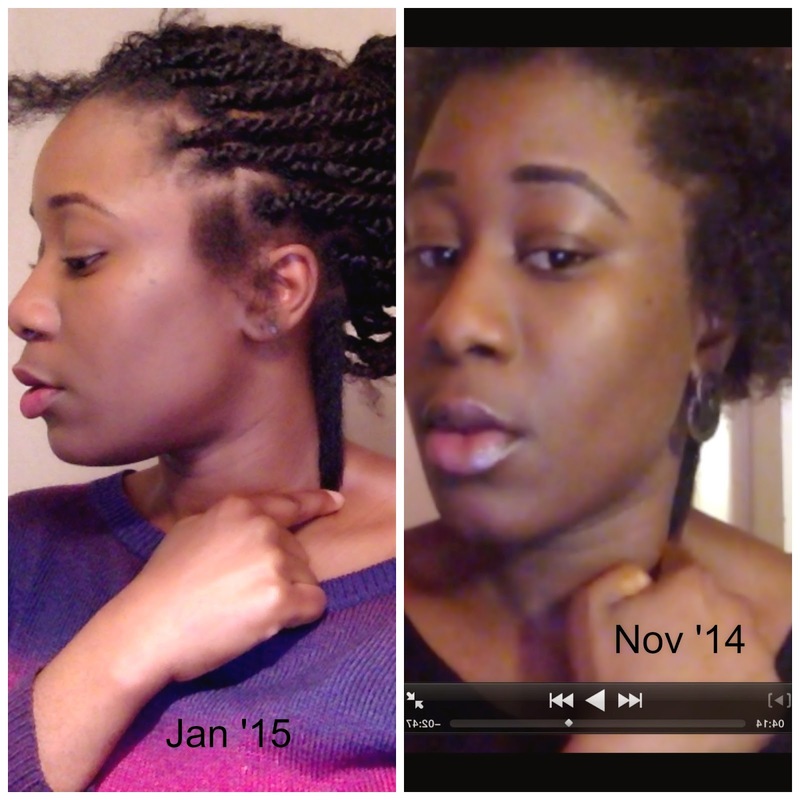 I became a youtube addict and started researching all things relaxed, hair growth and the likes, and there your have it, my hair journey was born. 2. 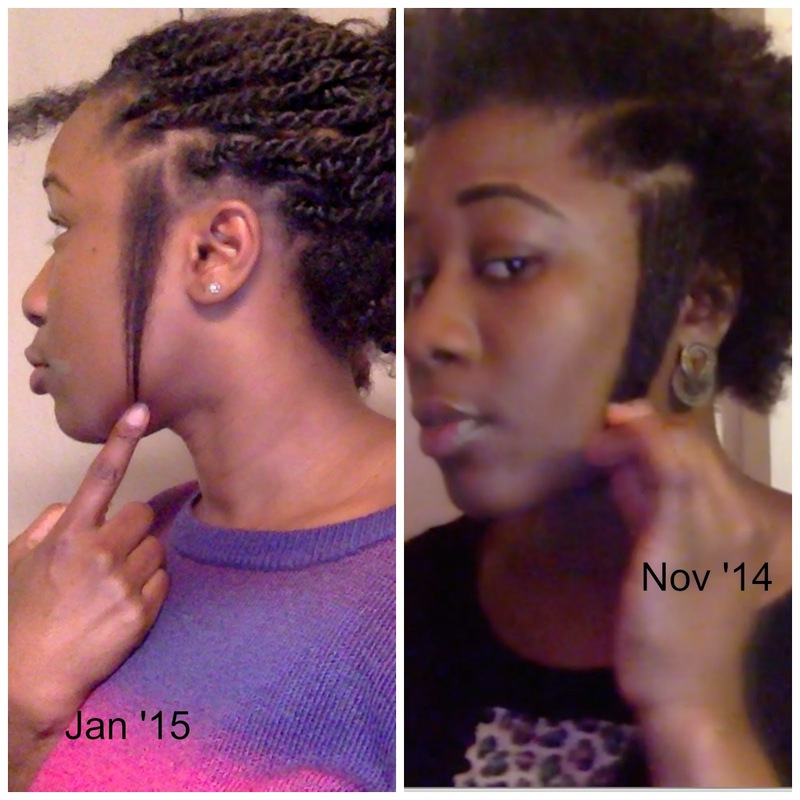 How long have you been on your hair journey ? I have been on my hair journey for about a year and 10 months? Nearly 2 years. 3. 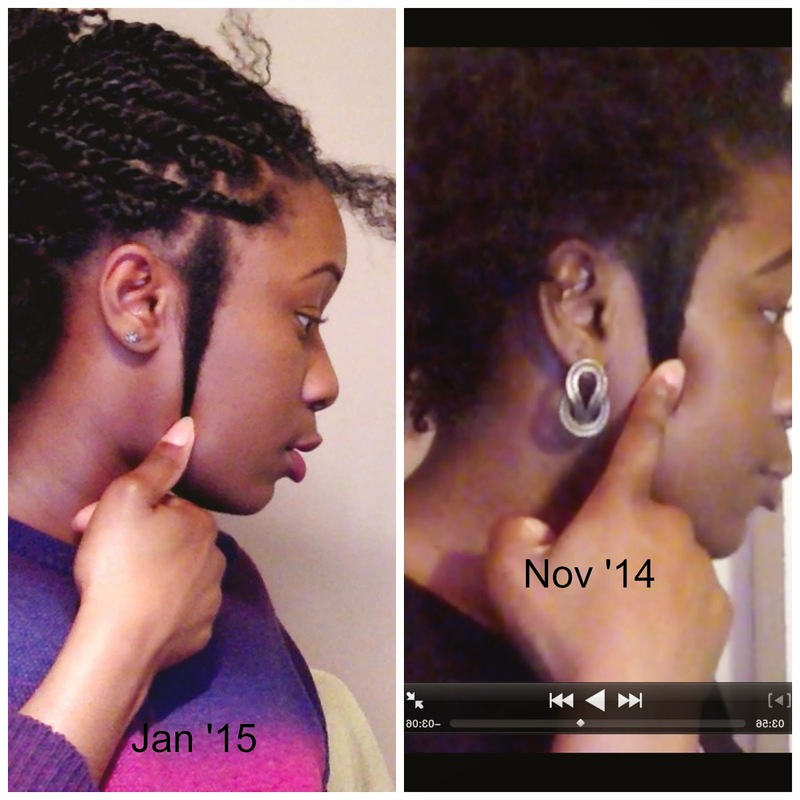 Are you natural, relaxed or transitioning ? 4. What is your hair length now ? 5. What is your goal length ? Short term, armpit length. Long term, Bra strap to Mid Back length. 6. What is your hair texture ? My hair is a mixture of 4b and 4c, with mostly 4c. 7. Health or Length ? I would definitely have to say health. Without health you won't have length. 8. If you could only live with one hair product what would it be ? This is a hard question but I would say Jane Carter nourish and shine. 9. What's the worse product you've ever used ? ALOEVERA JUICE!!! Made my hair so brittle!! 10. What is your go to hair style ? Since big chop, I would say a braid out/ twist out. But my hair stays under a wig for most of the week. Before while transitioning, I loved my buns. 11. Are you a product junkie ? Ehhh... Maybe ? Yes ? Yeah, I am. But I do have some staple products. 12. How often do you trim your ends ? I try to trim as needed. about 2 times a year. 13. How often do you use heat ? I hardly use heat! Last time I straightened my hair was in April of last year I believe, and that was the only time in 2014. While I was transitioning, I used a hair dryer, but always on cool air. 14. Do you take supplements ? I am in love with grapeseed oil, argan oil and Jamaican black castor oil, and I recently discovered jojoba oil. 16. Who is your hair crush ? I have a couple of them. Lulu of Pure Estrogen, Mstanish1, Jenn from jemy1415, and Chizi Duru, just to name a few. 17. How long does it take you on wash day ? 18. Worse thing that ever happened to your hair ? Seeing some chunks fall while washing off my relaxer. I cried!!! 19. Do you dye your hair if so what color ? 20. Who do you tag ? I tag everyone and anyone that wants to do this tag!! And thats it guys!! Heres the video, go check it out and please, like, share and subscribe!! Happy New Year once again!! I hope you all are looking forward to it cause I am. I feel like this year is going to be very good and I just pray that God sees us through this year, I pray that He helps lay the path for us to be able to accomplish all we set out to accomplish. I personally have a few goals I would like to accomplish this year. Everything from my health and hair, to my career, to my personal life and relationship. With regards to my hair goals, it is real simple. I would like to retain 6 healthy inches this year. To do that, I plan on incorporating some new steps and products into my regime, while sticking with old ones that work. All in all, I will be doing what best for my hair by keeping manipulation to the barest minimum! 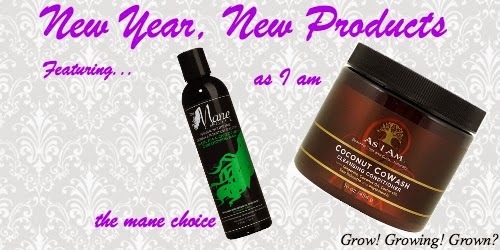 1) The Mane Choice Green Tea and Carrot Deep Conditioning Mask: This was one of the products I purchased this product during the wonderful thanksgiving sale. I am really excited to try it out as I am a big fan of the company. I have used their hair vitamins in the past and experienced nothing but good results, so I do have high hopes about this product. It is designed to: "penetrate the hair shaft like you’ve never seen before. Enriched with biotin, green tea, and carrot oil this product will immediately begin to repair damage and restore dried out strands. It doesn’t take much of this concentrated conditioner to rescue and restore your mane. This product has been specially formulated to promote growth and retention, and to fight shedding and breakage, and to ultimately give you the healthy luscious hair you have always dreamed of." It contains: Aloe Barbadensis (Organic Aloe) Juice, Cetearyl Alcohol, Ricinus Communis (Castor) Oil, Biotin, Helianthus Annuus (Sunflower) Oil, Avocado Oil, Brassica Oleracea Italica (Broccoli) Seed Oil, Carrot Seed Oil, Honey Extract, Silk Amino Acid, Green Tea Extract, Stearalkonium Chloride, Phenoxyethanol, dl-Panthenol (Pro-Vitamin B5), Hydrolyzed Wheat Protein, Cocos Nucifera (Coconut RBD) Oil, Vegetable Glycerin, Limmnanthes Alba (Meadowfoam) Oil (Refined). Essential Oil: Grapefruit, Lavender. I feel: that although my hair is not damaged, I am open to and happy for anything that is designed to "restore dried out strands" because as I have mentioned in the past, my hair is low porosity and any moisture aiding product is welcomed. Promote growth and retention, check and check. Hello to my exact hair goal!!!! The ingredients seem okay too, mostly good but my only fear is the aloe juice which is the first ingredient!! I have not had very good experiences with it, but I am still excited about this! No worries, I will be giving a review as soon as I start using it. 2) As I Am Coconut Cowash: I started off using coconut oil at the very beginning of my healthy hair journey, but then I quickly realised it didn't work for my hair, well until I discovered the best way to use it, as a pre-poo with a conditioner (Naptural85's method). So when I heard about this product, I figured it is a two in one, or even more so cause it also cleanses. Remember I once spoke about co washing and its benefits? and how I want to start trying it out again. Well I hope this product doesn't leave my hair limp like in the past when I co washed with ORS replenishing conditioner. It is designed to: "gently remove residue including all of the things you've used to style and maintain your coils and curls. This cowash is different from any other because it contains a special blend of natural ingredients that work to promote healthy hair growth from the follicular level. It spreads easily throughout hair, gently cleanses hair and scalp, maintains moisture, adds more moisture and helps hair retain moisture until your next cleanse, makes detangling a breeze, rinses easily from hair, helps promote a healthy environment for hair growth and it is gentle enough for daily use and safe for color-treated hair. It contains: Aqueous (Water, Aqua Purificada, Purified) Extracts: Cocos Nucifera (Coconut) and Citrus Reticulata (Tangerine)¹, Cetyl Alcohol², Cetrimonium Chloride, Cetearyl Alcohol², PEG-40 Castor Oil, Stearlkonium chloride, Cocos Nucifera (Coconut) Oil², Ricinus Communis (Castor) Seed Oil¹, Phytosterols¹, Serenoa Serrulata Fruit Extract¹, Quaternium-18, Potassium Sorbate, Fragrance/Parfum, Limonene, Methylisothiazolinone. I feel: this will really come in handy now as I am in braids. It will work perfectly as a two in one and would help avoid the extra steps and therefore cut down time. However, I cannot wait to use it on my real hair. Helps maintains moisture, adds more moisture and helps hair retain moisture? Check, check and another check. Helps promote a healthy environment for hair growth! Yes please!!!. As usual, I'll give updated on how it works both with the braids and without. So thats it, those are the new products I will be using this year. Knowing me, I'll probably purchase more throughout the year, but I really hope I can keep my junkiness to a minimum. Tell me, what new products have you purchased for this year? Or what do you have an eye on? Lets discuss in the comments.